DJ Khaled has become the modern-day inspirational speaker via Snapchat, and now, along with sharing the keys to success and reminding you to stop playing yourself, the social media sensation is sharing his tips to being best friends with some of Hollywood's biggest stars. Khaled, who will be hosting T-Mobile's first talk show on Snapchat, spoke to E! News about what it takes to be close with celebs like Drake, Kanye West, Beyoncé and more. "Patience is a major talent. He's an amazing person. Amazing talent," he says of Drizzy. "He's a great friend of mine. And when I say be patient, is because if you're patient and you get the opportunity to work with Drake, man, it's gonna be the biggest thing ever." As for Yeezy, "Be on your A game when you walk in the room with Kanye West," he says. "If you're not on your A game, you're finished. If you're not, you're gonna take over." Khaled also had wonderful things to say about Kim Kardashian, telling us, "I love Kim Kardashian, she's my friend. She's always supported me, and I'm happy for them two." He even takes some credit for helping bring her and Kanye together. Explaining that he met Kim while working on a song with Kanye, Khaled tells us he urged 'Ye, "Gotta marry this girl and you gotta have a baby, fast! As for Queen B, who he joined on tour recently, he tells E! News, "Soon as you see her, show love. I thank her every day for being on the tour, and I immediately leave the room because I don't wanna mess nothing up." LOL! And, of course, Justin Bieber Khaled had nothing but kind words to say about the young star, telling us, "Love my brother Bieber. Every time I talk to him, he makes me laugh," and adding, "Kid's amazing." 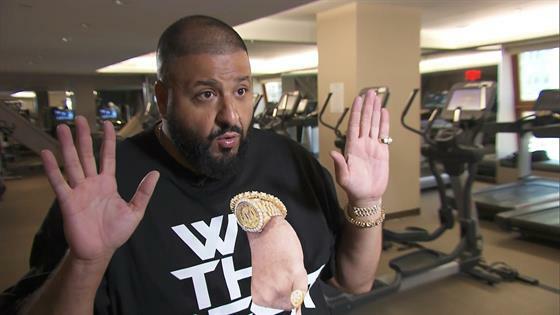 Watch the video for more keys from DJ Khaled!